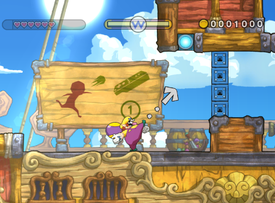 Aboard the Sweet Stuff is the first and a tutorial level in the game Wario Land: Shake It! As the name suggests, it takes place aboard the Sweet Stuff. At the beginning of the game, the Sweet Stuff automatically starts. Wario meets Captain Syrup there and a discussion begins. Everywhere, signs have been placed, similar to the first level of Wario Land 4. When the level is completed, he can enter a cabin on the Sweet Stuff also known as the Pirate Shop. This page was last edited on April 24, 2019, at 18:11.